Northern Light at Christmas Cove, Northport , MI. This was the first time I have been able to photograph them, I wanted to try something different compared to the shots I always see of the display. I implemented a technique often used on clear (often boring) night and set up a long exposure to capture the rotation of the stars. This night was everything but boring, the Northern Lights danced throughout the sky for hours. I wanted to give the dancing lights an interesting background and thought a star trail would do nicely. 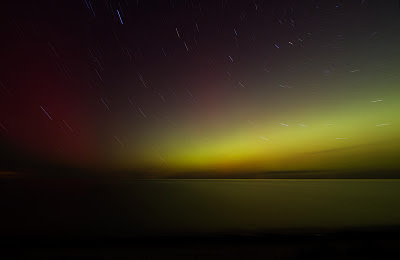 I chose the long exposure to depict the length of time the Northern Lights were vividly active in the sky. I am looking forward to seeing many more displays like this, it was a very interesting night with a beautiful display of Aurora. I hope you enjoy!! Technical details: Canon 7D, Canon 10-22mm lens (@10mm), ISO 100, F/5, 15 minute exposure.